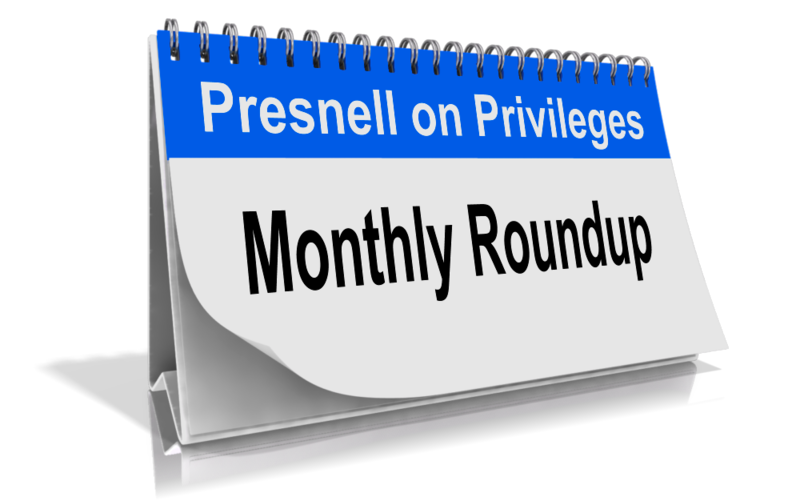 After skipping an August update due to trial preparation, here is my Monthly Privilege Roundup of interesting privilege issues for August and September 2017. The SEC is investigating whether PepsiCo fired its former General Counsel, Maura Smith, over her internal investigation into PepsiCo’s business practices related to an acquisition of a Russian company. How do we know? A PepsiCo outside counsel mistakenly emailed a Wall Street Journal reporter who then wrote a story about it. Read about the privilege-waiving email here, and the WSJ’s article here. Another privilege battle is brewing over a law firm’s investigation into sexual assault claims against a school. You will recall a Texas federal court’s privilege-waiver ruling on Baylor’s investigation (read about it here); now, the school is Ooletwah High School outside of Chattanooga, Tennessee. The Chattanooga Times-Free Press has a good write-up about the impending privilege ruling. Read it here. Have you heard about the controversial ATF sting operation in Albuquerque, which allegedly led to disproportionate arrests of black and Hispanic individuals? The former U.S. Attorney for the District of New Mexico provided an interview about the operation, but declined to answer several questions, citing the attorney–client and deliberative-process privileges. Read the story, complete with video of the interview, here. A Reno City Attorney cited the attorney–client privilege in refusing to release an investigator’s report into Reno’s strip-club industry. But the City Manager, citing transparency goals, overruled the city attorney, waived the privilege, and produced the report. You may read the story here, and view the report here. Although an Iowa statute provides an Ombudsman with authority to review governmental agencies’ private sessions, the Iowa Public Information Board refused to permit an Ombudsman review, citing the attorney–client privilege. This interesting battle is one worth watching. Story here. Special Investigator Mueller has demanded significant communications and documents from the Trump Administration, and a decision looms whether to produce the documents or claim executive privilege. Recall, of course, the overheard discussion between Trump lawyers Ty Cobb and John Dowd, profiled in this post. Good article from The Hill available here. Charlottesville citizens appear upset at the City’s internal investigation into the handling of the white supremacist events this past summer. One citizen anticipates the City will “hide” the investigation report under the attorney–client privilege because the investigator is a former U.S Attorney. This is an interesting, developing story. Read about it here. Single Depo-Prep Meeting with Multiple Employees—Privilege Waiver?